Key Difference: In programming languages like C and C++, functions and procedures are used interchangeably to describe subroutines that play a vital role in programming languages. However, in database-oriented programming languages like PL/SQL and Oracle, a function and a procedure slightly differ from each other. The prominent difference between the two is that unlike a procedure, a function must return a value. Functions and procedures play a vital role in most of the programming languages. They are basically used in modular programming. Modular programming is responsible for dividing a large code into sections of some smaller pieces of code. They are quiet helpful in programming as they reduce the unnecessary duplication of code. This ensures the clarity of a program code. Functions and procedures are helpful in the reusability of the code. In languages like C and C++, a function and a procedure are referred to as one and the same thing. However, in database-oriented programming languages like PL/SQL and Oracle, there is a prominent difference between the two. A function must return a value in PL/SQL and Oracle. However, a procedure in PL/SQL cannot return a value. In Oracle, a procedure can return zero or n values. In Oracle, procedures can have input/output parameters for them, whereas functions can have only input parameters. 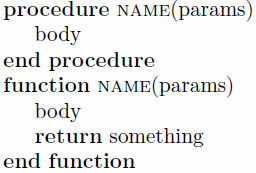 A function can be described as a set of instructions that performs a specific task. A function is assigned a name. It is important to mention that generally a code fragment is often referred to as a procedure and a procedure that returns a value is often referred to as a function. Thus, both have many similarities. They have similar components like declaration and calling mechanisms. The difference between the two depends upon the context of the programming language. Functions are named block programs (procedures) that carry out a specific task and also return a result or value. They are marked by the Function and End Function statements. A generic name for a block of VB statements that have a declarative statement (sub or function) and a matching ending declaration statement.